Prepare for the LISKening gentlemen!! Nice graphic . i like lisk application platform but unfortunately ETH developer winning the race these days . Lol thats so funny i posted it on my facebook profile. Would be great! The trend development is very nice. A very hard pump, than dump to half way so net net an increase. Hodll! why do you think, LSK could be @100$ ? Are there any fundamentals to proof this message ? For me, it looks like a snowball system because only the 100 delegates earns something, and they have to be voted to be on top of the 100 winners (which paid a lot of LSK to be in the voters list). On the other side, each transaction has a very expensive fee for 0.1 LSK for the chain operators and 0.1 LSK on the deposit place. That mean, a transaction costs 0.2 LSK. With a price of 100$ you have tp pay 20$ fees/LSK (20%) what's huge on the price level of 100. I don't see any future if this rules and fees consists and I no longer see much value for LSK because other projects with similar focus has made a good progress. Ethereum is the leader in that side chain biz today and still growing with real business cases and easy to use blockchain adaption. I can't imagine, that lsk has the same potential because the current circumstantes, which are in my personal opinion wrong. I'm in LSK since 2$ and sold them today for good money. just my 2 satoshis. correct me, if I'm wrong. Yes, the large fees are currently an issue. The good news is that dynamic fees are on Lisk's plate and should be addressed this year. The fees will be based on the current Lisk price vs USD. So they may set a fee of say $.25 per transaction instead of .1 LSK. which pool is run by the dev team, if any? Team don't run any delegate in top 101 currently. The team is running the delegate "lightcurve", but it's not a pool and as mentioned above, not in the top 101. 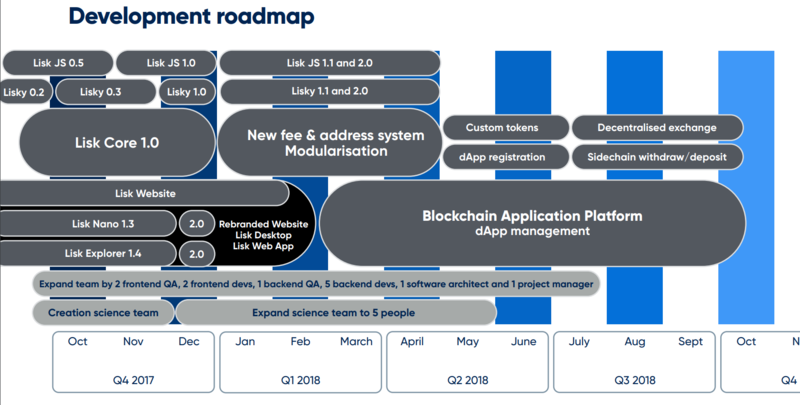 Rebranding, promotion and SDK launch will increase demands for Lisk. I'm looking forward to the first projects! Cant wait for those dynamic fees, so you guess they will be something like 25 cents per transaction? It will be the same fee for bigger transactions and for the smallest one? Is it possible to have two types of dynamic fees, one for bigger transaction and the other one for lets say one dollar worth transaction?? Time has come to change. Liskers deserve better reward ! What happen if I dont initialize my nano wallet? I'm just trying to get as much as I can before the rebrand. Bound to see some action. How long to get Lisk payment from voting delegates? Hey everyone, please help me get into the main-net forgers list by delegate voting bluedragon I will be offering 90% daily shares once forging as well as special bonuses of free LSK once in a while. I'm a coder and member of Lisk.builders who will work towards building the value of Lisk with useful projects based around the platform and will run various sidechains once the SDK is released offering free token airdrops to my voters.